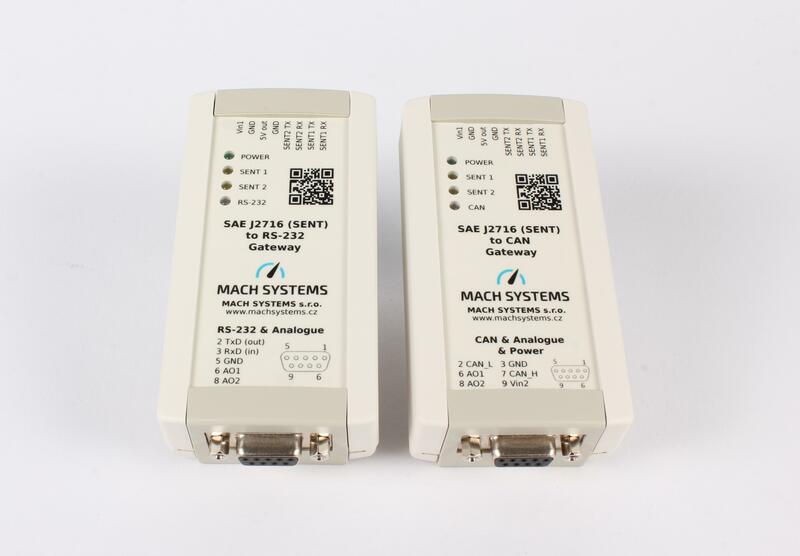 SAE J2716 (SENT) to CAN/RS-232 Gateway - MACH SYSTEMS s.r.o. 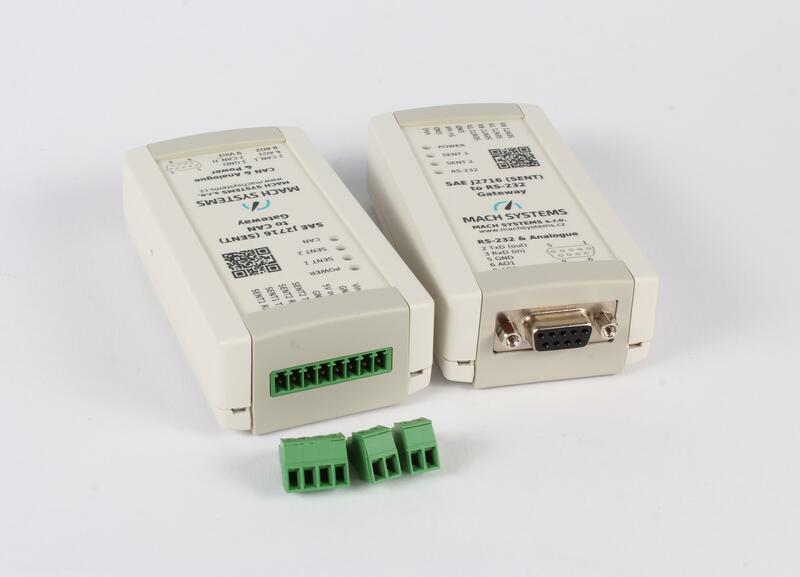 A SAE J2716 (SENT) to RS-232/CAN bus gateway features two bi-directional SENT (Single Edge Nibble Transmission) channels, two analogue output channels, and either RS-232 or CAN bus interface. The interface’s flexibility allows the user to use it as a PC interface / SENT data logger, a gateway for PLC or a test system, and generally for SENT communication monitoring and simulation. 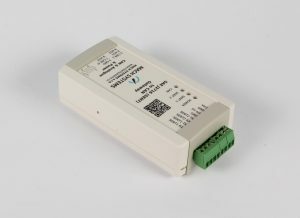 The analogue outputs offer the possibility to directly convert SENT data frame signals into an analogue voltage. 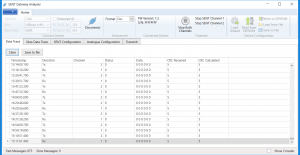 Get the SENT-CAN and SENT-RS232 Data Sheet. 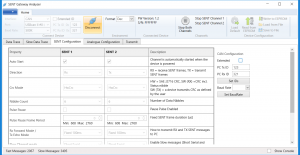 Fast, Short Serial, and Enhanced Serial message formats are supported. 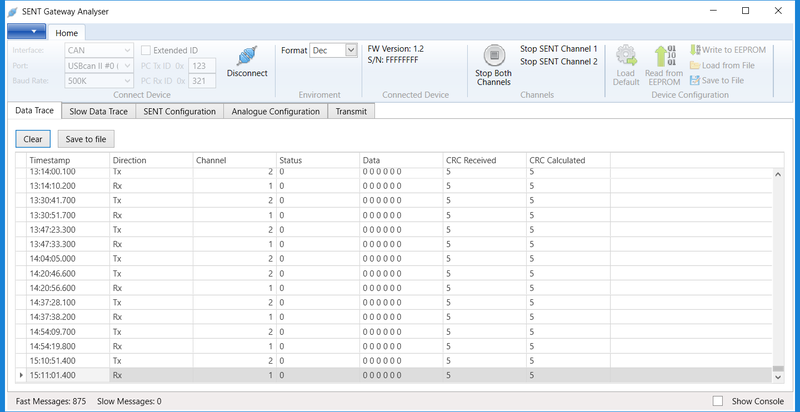 The user can configure channel parameters (direction, tick time, nibble count, filtration) and store the configuration into the device’s non-volatile memory. 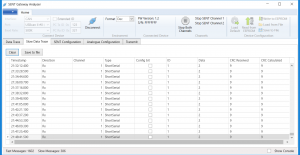 Each SENT channel can be configured independently to suit all possible use cases: 2 RX channels / 1 RX and 1 TX channel / 2 TX channels. 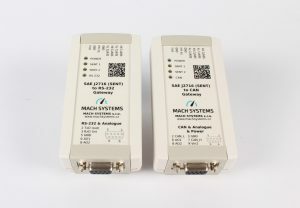 The converter offers two analogue output channels (12-bit DAC) that can be used to directly convert inbound SENT data frames into an analogue voltage. 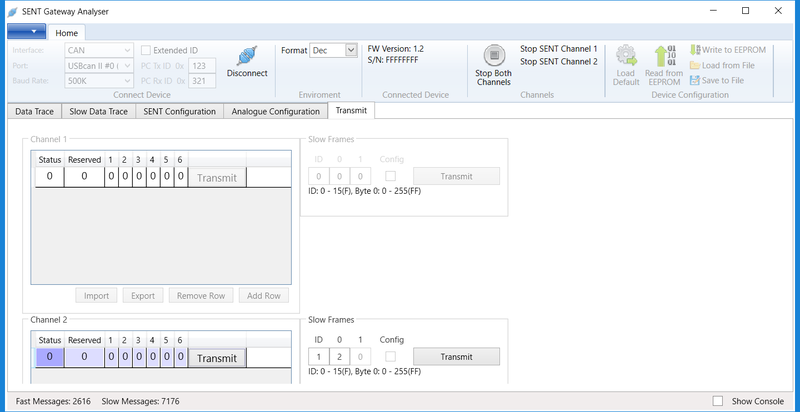 An analogue output channel can be mapped on any SENT channel. 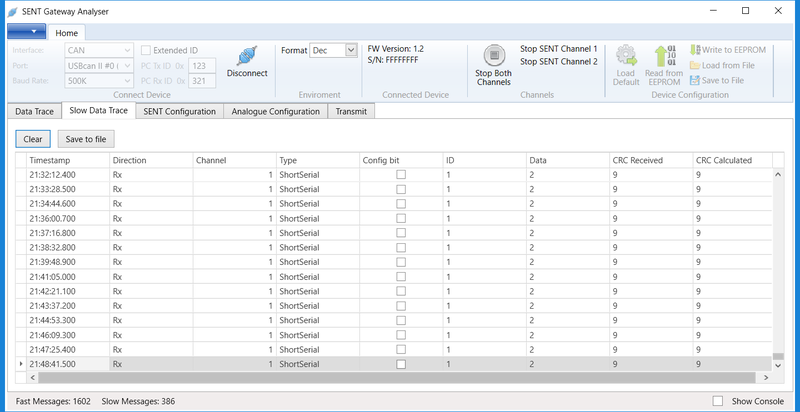 and the conversion parameters are fully configurable: StartBit, BitLength and a linear transfer function: Multiplier, Offset, Min/Max. An intelligent filtration of incoming SENT frames has been introduced so that RS-232 or CAN communication does not get overloaded. 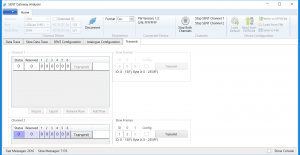 The CAN variant offers configurable CAN Identifiers for both TX and RX which allows multiple devices to be used simultaneously on the same CAN bus. The device’s firmware is upgradable from PC. 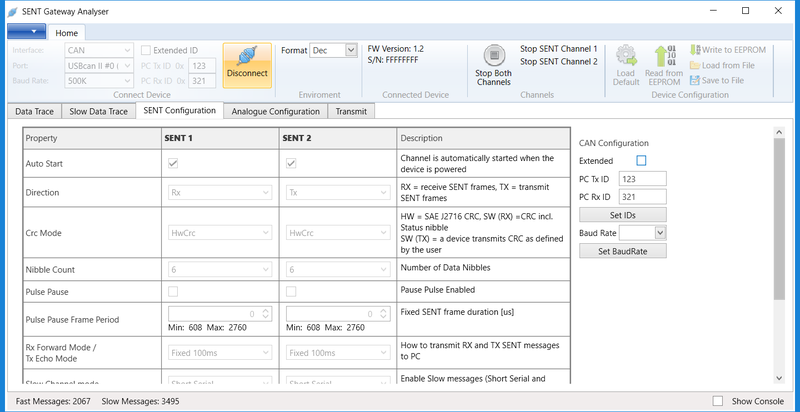 A PC application for configuring the device and for monitoring, logging and simulation of SENT communication is available for free. 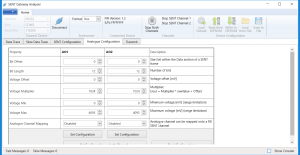 The device provides a communication protocol over RS-232/CAN so that the user can easily integrate the device into an existing system, such as test benches, HiL rigs and End-of-Line testers. 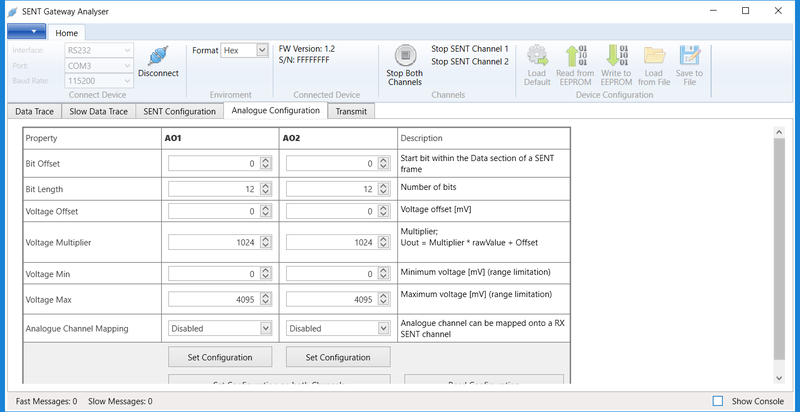 The protocol provides function to configure the device’s SENT and analogue channels and to transmit and receive SENT Fast and Slow messages.